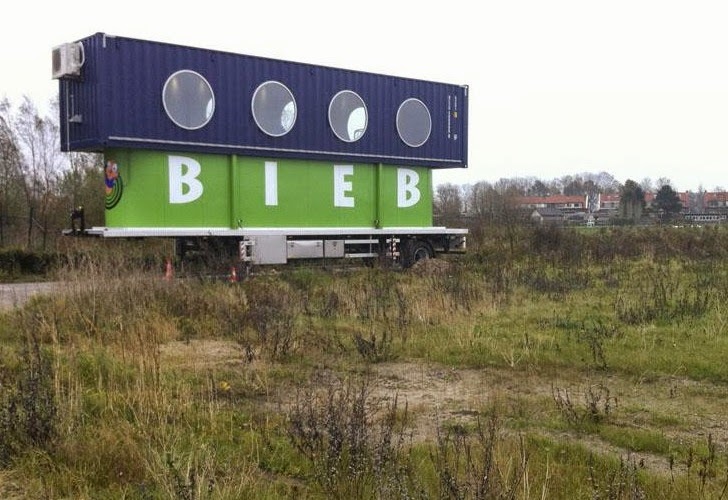 BiebBus is a truck-container that travels from school to school, offering 7,000 books and a reading room. Mobile libraries date back to 1905, when in Washington County, Maryland the first bookmobile offered its service to those American readers who would otherwise have no access to books, mostly the young and the elderly. The Netherlands also knows this tradition and has a wide network of regionally organized mobile libraries. On a personal note: I grew up in the rural northern part of the country and I remember feeling excitement for Tuesday afternoons when the 'bibliobus' would be in the village. It was the pre-internet era and the bus was a place of discovery. The Zaan region is part of the Amsterdam metropolitan area and consists of a series of smaller villages. On their own they can't finance a full-time library but the 'bibliobus' is a viable alternative. Contrary to the more rural areas in the Netherlands, this region is densely populated and has narrow streets. As such the conventional mobile library with a trailer providing for 50 m2 of library surface was not an option; the vehicle would simply take too much parking space. Architect Jord den Hollander designed a smart solution. Possibly inspired by his youth memory of Gerry Anderson's TV series Thunderbirds he developed the 'Uitschuif Biebbus' or the expanding mobile library. In order to solve a spatial challenge and simultaneously make a library visit into a spectacular experience, Den Hollander designed two rooms of which one can slide over the other. The smaller and inner space, the treasury, fixed to the trailer, is the more traditional library space with 7,000 books with a transparent ceiling. After the truck drives off the second space, a re-used shipping container, slides upwards and works as an exciting spaceship—a hang-out with fatboy cushions, a crow's nest for children to read, to internet or to get a bird's eye view of the neighborhood. Since September 2010 Den Hollander's idea has been operational in the Zaan region offering facilities for 35–40 children.